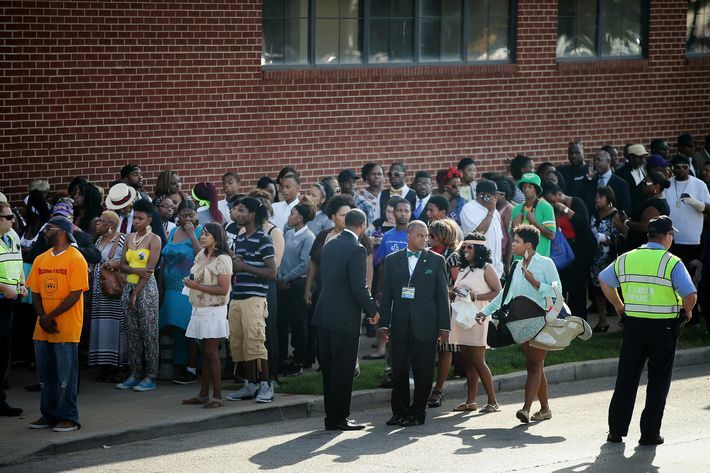 Yesterday in St. Louis, the family of Michael Brown Jr. laid the 18-year-old to rest, after two weeks of protests and violent uprising following his death — as an unarmed black man shot six times and killed by a white police officer — in a funeral the whole world was watching. Media tents lined the street outside Friendly Temple Missionary Baptist Church on Martin Luther King Jr. Boulevard, as reporters from Los Angeles to Italy and China to St. Louis interviewed the crowd. Spike Lee was there, and MC Hammer, and Wesley Snipes, along with the Reverends Al Sharpton and Jesse Jackson, Bishop T.D. Jakes (who got the biggest applause of all), and family members of other black men who’d been killed by whites who’d seen them as threats: Trayvon Martin, Sean Bell, Oscar Grant, Emmett Till — and even Martin Luther King’s son and daughter, Martin Luther King III and Reverend Bernice King. I didn’t hear a single person mention having read, or being aware of, the New York Times “no angel” article. 3. Most of those guys selling T-shirts outside the funeral that caused MSNBC’s Trymaine Lee to send an astonished and outraged tweet weren’t profiteers. One vendor, Reggie Jones, came from Charlotte and has been in Ferguson for a week, asking $10 but taking as little as $5 and donating the proceeds to the family. Yashua Anton, 42, who was selling “Hands Up, Don’t Shoot” shirts in a pinstripe suite, had come from Chicago, where he runs a printing business catering to Historically Black Colleges. Trayvon Martin’s father, Tracy, is his fraternity brother, which is how he met Mike Brown Sr., who had given Anton his blessing to come. Anton had already made a lump sum donation to the funeral and was planning to donate a portion of the $4 he made on each shirt to the family’s legal fees. More than money, though, Anton, Jones, and their associates see the T-shirts as a public good — a form of productive venting, and a way to keep the cause visible. 5. The church is enormous — with 2,500-capacity sanctuary that makes New York’s Beacon Theater look small — and equipped with state-of-the-art technology. Two large TV screens inside the sanctuary showed the ceremony, and a live-stream was going out to four other spillover venues that brought the local capacity to around 5,000. The church is a 16-minute drive from Ferguson and save for the church, the neighborhood looks equally desolate. 6. One elderly woman in the crowd, in a sparkly knit hat and a sparkly shawl, brought her own tambourine and maracas. She stood up and played them whenever the spirit moved her, which was often. 7. Brown’s mother, Lesley McSpadden, and father, Michael Brown Sr., didn’t speak, but they did write touching notes to him in the funeral program. “I want you to know that you were the purpose of my life/ Out of everything that I did — it was you that I did right,” read McSpadden’s. Brown’s obituary in the program touted his love of PS4 and Xbox. 8. The entire left side of the sanctuary was reserved for 600 members of the Brown family party. The group included eight street preachers who became the “first responders” to the crime scene, praying and pacing in a line between the police and angry Ferguson residents for nearly five hours. 9. Despite the family’s request that people not take pictures during the ceremony, lots of people did. 10. There were moments of pure chaos and joyous reverie, particularly when the choir broke out into rousing songs like “Praise Him” and “Every Praise Is to Our God,” and the entire building erupted in raised voices, raised hands, and stomping feet. Strangers grabbed strangers hands, or gave their neighbors hugs. Where I was sitting, every single person knew every word. 11. The church’s pastor, Michael Jones, asked speakers to “bless this family with brevity,” because they had made a promise to the school district that they would clear the streets in time for buses to get through without any delays that might endanger children trying to get home. 12. Relatives referred to Michael by his various nicknames: Big Mike, Mike Mike, and the Gentle Giant. 15. Religion cannot be separated from the narrative of how black residents of Ferguson and surrounding communities are coping with Brown’s death and its aftermath. The funeral was named Michael’s “Home Going Service.” His cousin Bernard Ewing and another cousin, Eric Brown, repeated what has become a healing refrain for this family, the story of how two weeks before his death, Michael accepted Jesus as his savior. “He said he was saved!” said Ewing, to a roar from the crowd. Both friends and family spoke of how in the last few weeks of his life, Michael had told them that he was going to be famous and that the whole world would know his name. 17. So many people crowded the aisle of the church taking pictures of Michael’s casket or just cluelessly trying to get out that pallbearers had to wait for five minutes amid the crowd before reaching the hearse. 19. 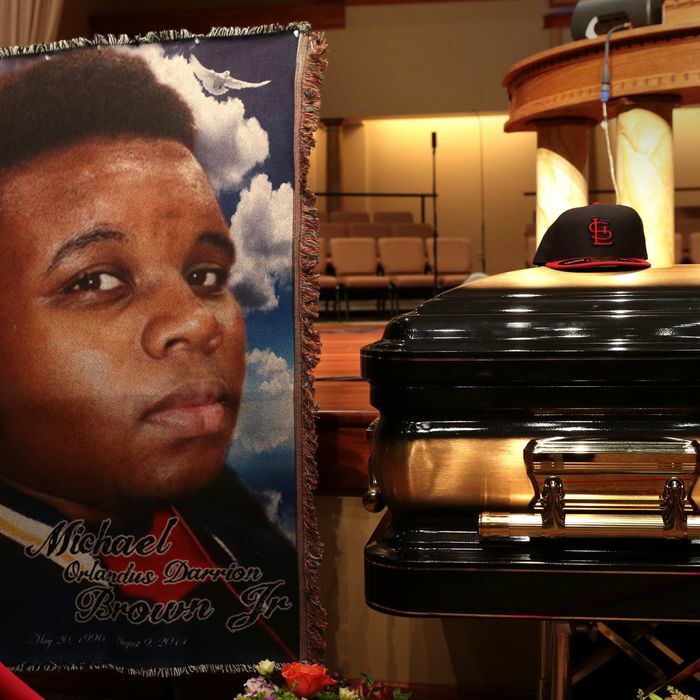 The mourners sang at the cemetery, too — “I’ll Fly Away” and “We Shall Overcome.” Michael Brown Sr. released a white dove as his son’s casket was interred, as a final good-bye.